After a moment, the performers don red clown noses and erupt with mutinous abandon. 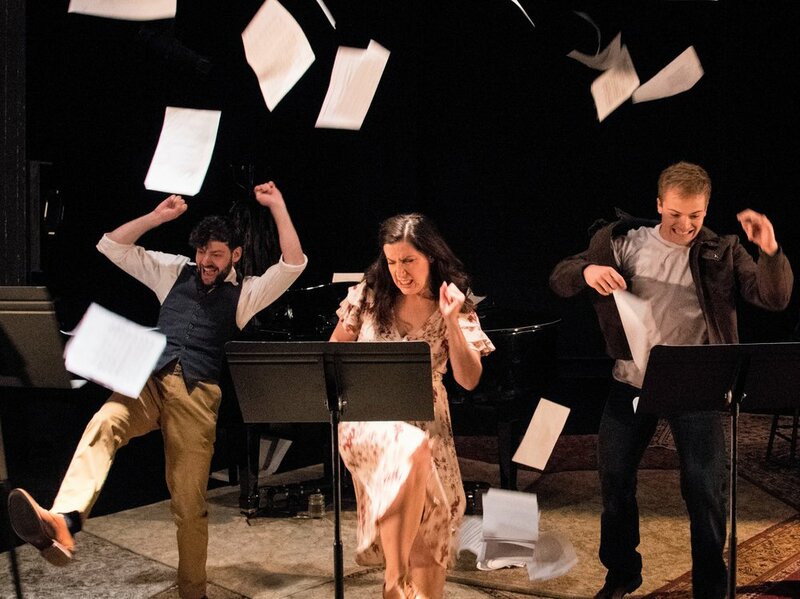 They toss the sheet music into the air, slam the music stands to the ground, and rebelliously leap on and off the piano. The revolution has begun, and it will not be televised. Christine Hamel (foreground) as a sultry singer with (left to right) Ashley Michelle, Miguel Castillo and Sebastian LaPointe in Brecht on Brecht. Top, from left: Harrison Bryan, Hamel and Jake Murphy tearing down the house. This is a fitting opening for a show that celebrates the life and work of Bertolt Brecht (1898–1956), whose main objectives consisted of breaking down what he considered the calcified conventions of bourgeois theater and motivating audiences to social and political activism. Originally produced Off-Broadway in 1962, Brecht on Brecht is a musical and dramatic collage of Brecht’s writings, which have been culled by George Tabori. In the current production, director Jim Petosa has assembled a likable cast of four central performers, who are supported by an equally likable four-person ensemble. The cast’s youth and likability, however, are sometimes a detriment to the show. On occasion they minimize the incendiary call-to-arms Brecht’s words can provoke. For those uninitiated with Brecht’s art and philosophy, the revue structure might seem somewhat chaotic and confusing. Eschewing the typical “and-then-he-wrote-this” approach to a theater tribute, for instance, the show fuses (seemingly arbitrarily) excerpts from poems, plays and essays. The extracts are generally not contextualized within the artist’s biography or professional output, so that often there is a sense of alienation and fragmentation (which is probably the point, since that was central to Brecht’s aesthetic and directorial approach). 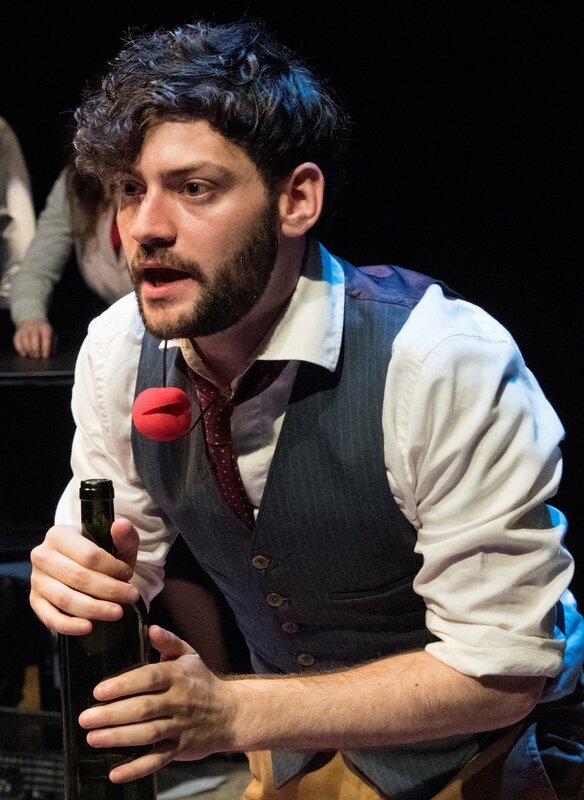 Bryan with a bottle of booze and a clown nose in Brecht on Brecht. Photographs by Stan Barouh. Throughout the evening are also several musical numbers for which Brecht wrote the lyrics. Among the most famous are “Surabaya Johnny” and “Pirate Jenny” (performed by Carla Martinez and Christine Hamel, respectively), and Harrison Bryan delivers a chillingly effective “Ballad of Mack the Knife.” Indeed, individuals familiar only with Bobby Darin’s swinging, hip version of the song may be surprised to hear the haunting, dirge-like quality as it is generally sung in Brecht and Kurt Weill’s musical The Threepenny Opera. Jake Murphy and Martinez perform “Tango Ballad,” also from Threepenny Opera, with simmering passion. As the periodic musical numbers reveal, the piece is at its most successful when it slows down and shines the spotlight on individual performers; that allows space for extended Brechtian passages. A highlight occurs late in the show when Hamel presents a devastating performance of The Jewish Wife. The one-act play is part of a larger cycle called Fear and Misery of the Third Reich, and it paints a sobering portrait of a Jewish woman who is leaving Germany to protect her Gentile husband from the Nazis. Presented mostly through a series of telephone calls, the playlet is disturbing in its ordinariness. The woman’s story comes through as she calmly calls a friend to cancel a bridge game, for example, and asks her sister-in-law to occasionally look in on her husband. The main takeaway from the production is that more than ever, writers, poets, and theater artists need to be the voices of social justice and change. Brecht once wrote: “Art is not a mirror held up to reality but a hammer with which to shape it.” Brecht on Brecht is a timely reminder of the necessity for theater that puts on a clown nose, takes up a hammer, and dismantles polite theatrical conventions. The PTP production of Brecht on Brecht plays through Aug. 5 at the Atlantic Stage 2 (330 West 16th St. between Eighth and Ninth Avenues). Evening performances are at 7 p.m. Tuesdays through Sundays; matinees are at 2 p.m. Saturdays and Sundays, and on select Wednesdays and Thursdays. Tickets are $37.50, $22.50 for students and seniors. For exact days and times, call (866) 811-4111 or visit PTPNYC.org.